Of all the varied and mysterious Great Old Ones of the Cthulhu Mythos, few ensure the imagination as easily as Hastur. The image of the silent, deserted city beside a dark, foreboding lake where sinister things lurk is one that stays with the reader. Many of us have walked the twisting streets of that dead alien city in our minds, finding our way into the tall towers to stand before an ancient throne. There sits the King in Yellow, the Lord of Carcosa, who gazes at us from behind his Pallid Mask. It is a journey many of us have taken, whether alone in our dreams or around a table rolling die with our friends. It is a journey we are about to take again. Ripples from Carcosa seeks to expand upon the mythology of the 'He Who Should Not Be Named' and it gathers much of the varied material on Hastur into one place. The first chapter reviews the Great Old One Hastur and his various avatar forms. It examines the Yellow Sign, the play 'The King in Yellow,' the Mythos tome of the same name, and the effects these things have on the human mind. 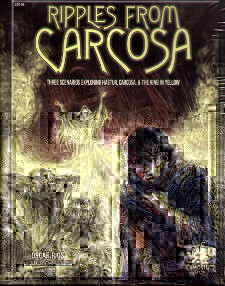 Within these pages are a trio of adventurers pitting the investigators against Hastur and his human worshippes, playable as either standalone scenarios or as a linked campaign, called 'Ripples from Carcosa.' Each scenaio focuses on a specific time period. Roman Invictus, Dark Ages, or the End Times of the far future. Pre-generated investigators are provided for each scenario, although keepers should feel free to incorporate existing player investigators if so desired.